Does Mitt Romney see immigration as a Rick Perry's weak spot? TAMPA -- Mitt Romney took a hard line on immigration Friday in a speech to a group of Hispanic Republicans, drawing potential battle lines with his surging rival, Rick Perry, in this pivotal swing state. Addressing the Republican National Hispanic Assembly, Romney noted that he vetoed in-state college tuition for the children of illegal immigrants when he was governor of Massachusetts. "We must stop providing the incentives that promote illegal immigration,'' he said. Romney also said he backs completing a high-tech border fence and requiring employers to use electronic databases to verify employees' legal status. Romney, who got a warm reception from his audience, didn't mention Perry by name, but the contrasts were obvious. Perry, the governor of Texas, has questioned the effectiveness of a border fence and programs such as E-verify, and he has defended his decision to sign a 2001 law giving tuition breaks to undocumented high school graduates. "To punish these young Texans for their parents' actions is not what America has always been about," Perry told The New Hampshire Union Leader in July. By raising immigration -- an issue totally eclipsed by economic concerns in the campaign so far -- Romney signaled that he is preparing to join the fray after months of a hands-off approach to his Republican rivals. 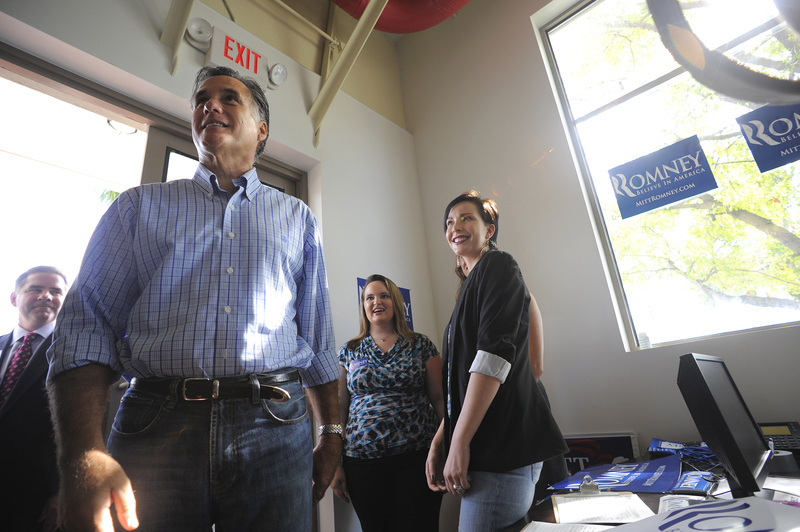 Perry's sudden trajectory leaves Romney with little choice. In what is becoming a hallmark of his stump speech, the former Massachusetts governor trashed "career politicians,'' a subtle swipe at Perry's two-dozen-plus years in office. While Perry has taken stolen the lead from Romney in some national polls, a Sachs/Mason Dixon poll in Florida released one week ago showed Romney ahead with 28 percent of the Republican vote, followed by Perry with 21 percent and Michele Bachmann with 13 percent. Florida is poised to cast a decisive vote in the Republican nominating process, potentially hosting the first big-state primary and the fifth contest overall in 2012. Perry has a better track record than Romney when it comes to Hispanic outreach, which will be crucial in Florida and in a number of other swing states. Perry won a respectable 38 percent of the Hispanic vote in Texas against Democratic challenger Bill White in his 2010 reelection campaign. Romney was trounced by Sen. John McCain, R-Ariz., among Hispanics in the 2008 Florida primary. McCain got 54 percent of the state's Hispanic vote; Romney, 14 percent. Both Romney and Perry oppose the "Dream Act'' in Congress, the federal version of guaranteeing tuition breaks to the children of illegal immigrants. Florida Rep. Darren Soto, one of two Hispanic Democrats who bashed Romney in a phone call with reporters, called the legislation an "anchor'' in the Hispanic community. Romney devoted most of his speech to the Hispanic group to the economy, the foremost concern for voters across the board. Later in his speech at his campaign headquarters, he plugged his jobs plan, to be unveiled in the Las Vegas area on Tuesday, and lamented Friday's disappointing jobs report. "There is zero faith in Barack Obama because he's created zero jobs last month,'' Romney said. In a gesture to another influential voting bloc in Florida, Romney dropped into a meeting of the American Israel Public Affairs Committee on Thursday night before addressing the Hispanic group on Friday. No other state, save maybe Iowa, demonstrates reflects the differences between Romney's first and second bids for the White House as well as Florida. In February of 2007, he was the first presidential candidate - of either party -- to make a major appearance in the state. He was also the first to run television ads. Romney allies lobbied the state Republican Party to host a straw poll in the hope that it would help the hard-charging newcomer to the national make a name for himself. In what was viewed as a major setback for him, state party officials refused. In the Florida primary, Romney ended up in second, all but sealing the nomination for McCain. Four years later, the Florida Republican Party is hosting a straw poll in Orlando on Sept. 24, but Romney won't be there. Depriving his rivals of a chance to knock down the frontrunner, Romney announced months ago that he would not participate in any straw polls this election cycle. Romney's visit this week marked his first trip to Florida since mid-June. He has yet to run any television ads in the state. His slower-going approach, however, belies the continued significance of Florida to his campaign. He's well positioned in New Hampshire and Nevada, two of the earliest voting states, but less so in South Carolina and Iowa, making a strong showing in Florida crucial. Attorney General Pam Bondi attended his campaign headquarters opening and welcomed Romney to her hometown of Tampa, but she did not make an endorsement. Romney promised he would be back. Boxer, who is covering the Romney campaign for CBS News and National Journal, reported from Tampa; National Journal's Reinhard, who covered the 2008 presidential campaign for the Miami Herald, reported from Washington. National Journal's Scott Bland contributed.